Every month we bring you the latest rummy apps that bring excitement and fun of playing online rummy to your hands. In this month of July, we have picked 3 rummy apps that are so good with the user friendliness and the user interface they provide. We have also provided rating points for each of these apps which will help you to take your decision on which rummy app to download & keep on your smartphone or tablet forever! Byterun’s Gin Rummy app is a very engaging social rummy game with big cards and amazing game dynamics. The game offers you with automatic sorting of cards and a good animation while you pick or discard cards. The game doesn’t have so much of pop-up ads and also comes with a auto save feature if you accidently exit the game. 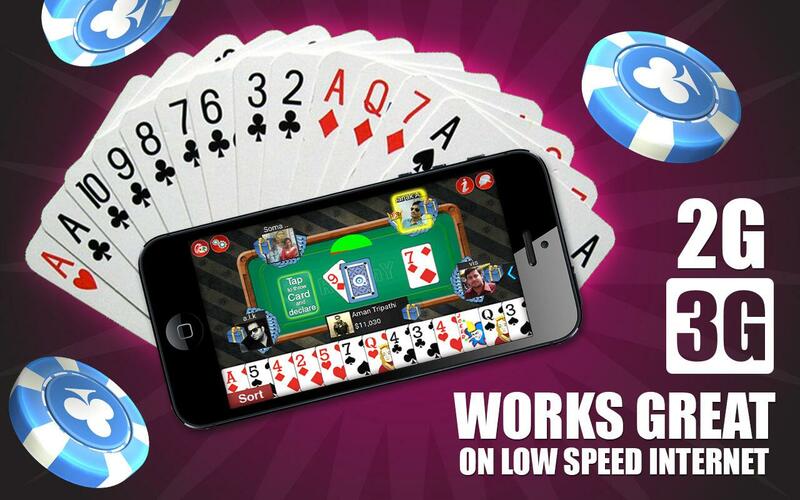 Gin Rummy app from Byterun is available for Android, iOS and Windows smartphones and tablets. We rate this game 3 out of 5. Nerdylotus has brought the second version of the Indian Rummy game with more features and stable gameplay. The game still boasts on the traditional approach to the game of 13 cards and features some of the best classic rummy tables. The game will take only 6.3 MB of your device which makes it our first choice whenever we need to play mobile rummy games with our friends. The rummy app supports Android, iOS and Windows smartphones and tablets. We rate this game 4 out of 5. As the name suggests, this HD Gin Rummy game is so intriguing with nicely designed game lobby, cards, avatars etc. Join the tables with any of the 9 character as your avatar and learn as you master the rummy game skills. This rummy app has an in-game coach in form of a dragon to help you clear your levels and achieve mysterious achievements. The game also offers different variations like Oklahoma, Aces High or Low, Fast 7 Card when you opt to download the paid version. The game is available on iOS, Android and Windows platforms. We rate this rummy app 5 out of 5, a must buy for every rummy game enthusiast. To read our previous article on top rummy apps, click here.